Earn 201 points upon purchasing this product. Use 2014 points to purchase this product! 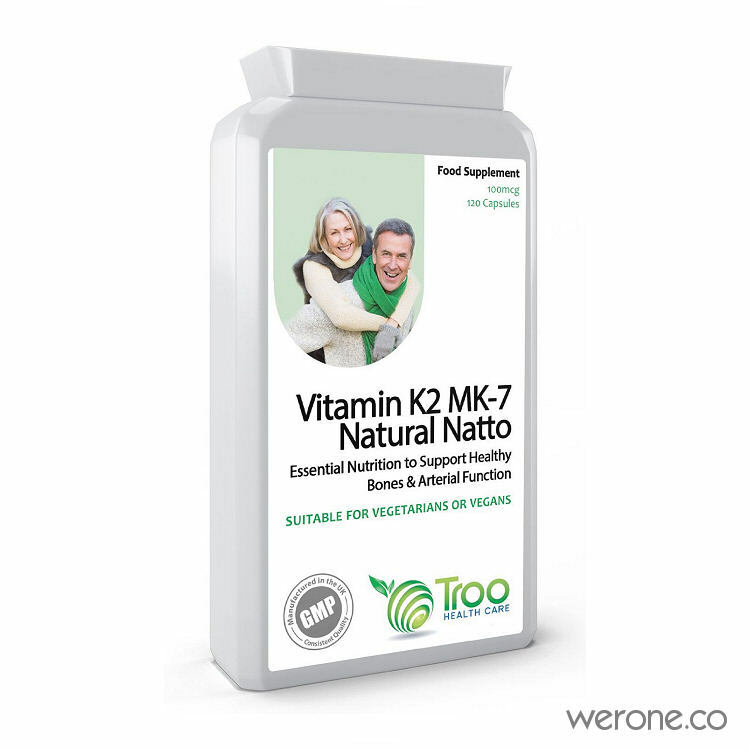 Vitamin K2 MK-7 Natural Natto provides a premium quality and easy to swallow daily vitamin K supplement . Vitamin K is renowned for its role in the synthesis of a number of blood coagulation factors. More recently however, Vitamin K2 and its dependent proteins have been shown to be of vital importance for bone and vascular health. Troo Health MK-7 (Menaquinone-7) contains a highly biologically active form of Vitamin K2 derived from natto, a traditional Japanese fermented soyfood. It is non-GMO, organic, allergen-free, and has a stable fermentation process in a vegetarian capsule providing 125% of the recommended daily allowance. Vitamin K is a fat-soluble vitamin most well known for the important role it plays in blood clotting. However, many do not realize that there are different kinds of vitamin K, and they are completely different. The health benefits of vitamin K2 go far beyond blood clotting, which is done by vitamin K1, and vitamin K2 also works synergistically with a number of other nutrients, including calcium and vitamin D.
If you opt for oral vitamin D, you need to also consume in your food or take supplemental vitamin K2. “There are so many people on the vitamin-D-mega-dose bandwagon, taking more and more of vitamin D. And it could absolutely be causing harm if you are lacking the K2 to complete the job to get the calcium where it’s supposed to be,” Dr. Kate Rheaume-Bleue warns. MK-7 (menaquinone-7), longer-chain forms found in fermented foods. There’s a variety of these long-chain forms but the most common one is MK-7. This is the one you’ll want to look for in supplements, because in a supplement form, the MK-4 products are actually synthetic. They are not derived from natural food products containing MK-4. Vitamin K1 exclusively participates in blood clotting — that’s sole purpose. K2 on the other hand comes from a whole different set of food sources, and its biological role is to help move calcium into the proper areas in your body, such as your bones and teeth. Troo Health Care Vitamin K2 Capsules are manufactured in the UK to GMP code of practice and ISO 9001 quality assurance certification. Only the finest quality raw materials in their highest and purest form are used. Combination of Milk Thistle, Artichoke, Dandelion, Peppermint and Boldo A.Vogel’s Milk Thistle Complex was amongst the very first herbal products formulated by Alfred Vogel, one of Switzerland’s best known naturopaths. The seeds of Milk Thistle are combined with four other important herbs used in healthcare for centuries – fresh extracts of Dandelion, Artichoke, Peppermint and dried Boldo leaves. Comes in tincture form. Boswellia serrata is a plant that produces Indian frankincense, Salai, referred to in Sanskrit as shallaki and in Latin as Olibanum Indicum. the plant is native to much of India and the Punjab region that extends into Pakistan. In Ayurvedic medicine Indian frankincense has been used for hundreds of years for the treatment of arthritis as it is anti-inflammatory, the main active component is Boswellic Acid (AKBA). Glutamine powder is an essential amino acid supplement that is anti-inflammatory and necessary for the growth and repair of your intestinal lining. L-glutamine benefits include acting as a protector: coating your cell walls and acting as a repellent to irritants.